Looking for older PowerBot models? Check the PowerBots Archive. PowerBot is the complete all-in-one power supplier module from the GroLab™ family. This powerful unit provides the tools to monitor, control and automate all the basic elements of any agricultural grow, maximizing the plants’ growth and overall efficiency. Equipped with a temperature and humidity sensor, which allows the PowerBot to keep the perfect climate conditions for your plants, at the same time GroLab™ makes it simple and easy to customize the desired temperature and humidity values. PowerBot has 4 universal outlets supporting up to 2300W (per outlet and in total) or unlimited power when using an external electrical contactor. Lighting & ventilation systems, water pumps, humidifiers, heaters and Co2 dispensers are some peripherals examples that PowerBot can automate. This PowerBot model extends the capabilities of its predecessor, supporting even more sensors, such as one flood detector, one universal sensor (e.g. water level sensor, motion/smoke detector) and one combined sensor. Its design features 5 LEDs, 1 per outlet that indicates if the plugged device is ON, and another LED that indicates the module state (powered on and connectivity). PowerBot also offers external switches that provide manual control on the spot. Besides automating most of the growing tasks, PowerBot also allows you to create safety protocols & procedures to avoid overheating and minimize the damage in case of fire or flood. With this powerful module, your grow is always under control, reducing the maintenance time and the constant fear of losing your crop! With the combination between the temperature & humidity sensor and the capacity to independently control the electrical devices, it is possible to perform a precise climate automation. This feature makes the PowerBot a perfect tool to keep your growing environment with the perfect climate conditions for your plants to grow in a healthy way. GroLab™ system allows you to automate any lighting system connected to PowerBot. It provides a huge amount of options when creating lighting schedules. Including the possibility to fully customize the day/night cycles length of your grow(s). Connecting irrigation devices to PowerBot allows to fully automate the irrigation systems. 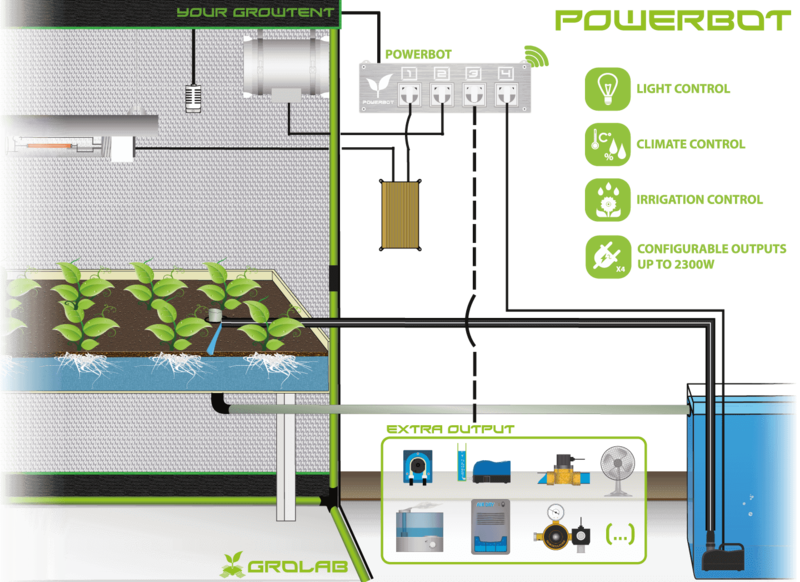 Thanks to the programmable procedures provided by the GroLab™ system, it is possible to perform distinct irrigations during day and/or night periods and even separate those processes by groups of plants. This module supports 1 switch sensors (universal input) of your choice like a water level sensor, allowing to continuously monitor the water level of your tank. With the right peripherals connected to the PowerBot, like water pumps, user can create procedures to automatically drain and refill the tank. PowerBot allows you to create safety protocols & procedures to avoid risk situations or even react to them in order to minimize the damage. Overheating and fires are some examples of risk situations that PowerBot can handle. There are also 2 main security features included on PowerBot: the cool-down time which prevents damage to devices that need some time to cool down before turning them on (HPS) and the security actions when losing communication with GroNode (the system's core module). All of these makes the PowerBot a life saver for any grower. PowerBot communicates with GroNode (the system's core module) through radio frequency with a range of 25 meters indoors (depending on obstacles) and 100 meters in open spaces. This makes it easy to install the PowerBot on your growing area or even on the outside. Using GroLab™ Software user can monitor and analyze the climate variables and the devices current state in real time. The software provides you notifications, charts, grow(s) overview and even allows you to export the sensors/devices values from the beginning of your grow(s) life cycle. When you provide Internet connection to GroNode (the system's core module) it can send real time alerts and updates to your e-mail about the state of the devices and sensor connected to PowerBot. It will also notify you in case of any issues arises. Its design features 5 LEDs, 1 per outlet (PowerBot offers 4 outlets) that indicates if the plugged device is ON, being useful to visually understand what is happening in your grow(s). Besides from the LEDs of the outlets, this module includes a LED that indicates if the module is currently powered on and the connection state with GroNode (the system's core module). When connecting the GroNode (the system's core module) to a router with an Internet connection, it allows you to activate the GroLab™ system's remote control. This feature grants user access from anywhere at any time through an easy-to-use software. Allowing to fully control all the modules, including PowerBot.